Lake Tahoe boasts some of the most exciting winter activities in the US. With the stunning views of Lake Tahoe from the top of Heavenly, to the steep slopes at Kirkwood, adventures are a given in the winter. 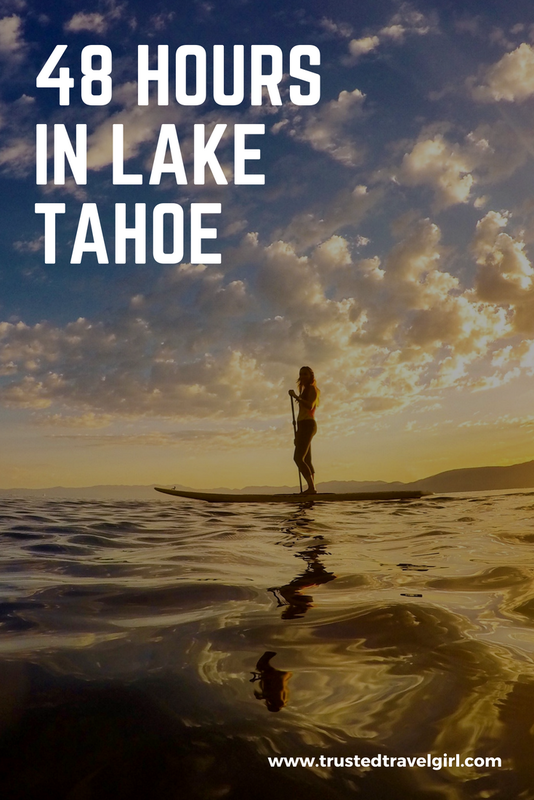 What most travelers don’t realize is that summer in Lake Tahoe can be just as exciting, and is possibly even more beautiful than a Tahoe winter. I recently spent a weekend exploring all of the summer adventures that the Lake Tahoe area had to offer. Although San Francisco is the nearest major airport, it’s best to fly into the Reno-Tahoe airport. 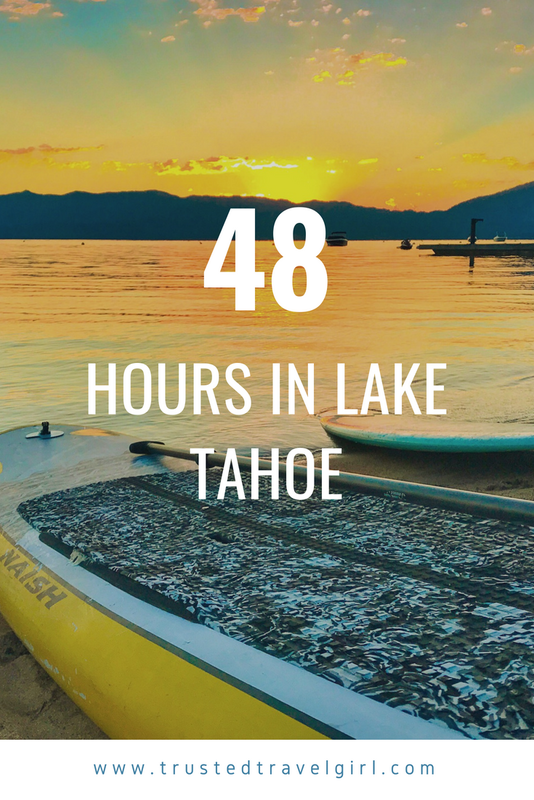 With the opening of the new highway 395, it only takes 45 minutes to get to South Lake Tahoe. Skip the crowds at other marinas and get out on the water at Camp Richardson. Perfect for paddle-boarding or kayaking. As the sun slowly creeps over the mountains, the lake will reflect the yellow, pink and orange colors in the sky. Without the boats out on the lake, the water is glassy and smooth, perfect for beginner paddle-boarders. Be sure to bring a GoPro or waterproof camera to capture the moment! When you get off the lake, you will definitely be ready for breakfast. Head across the street to the Alpina Cafe for bold flavored coffee and delicious oversized breakfast sandwiches. Kirkwood is a place to get away from it all and get back in touch with nature. With colorful wild flowers growing over 4 feet tall, and snow still covering the top of the mountain like icing on a cupcake, Kirkwood is stunningly beautiful in the summer. Hike, mountain bike, or just hitch a ride on the chairlift to take advantage of the spectacular scenery. My suggestion is time your trip to Kirkwood for the Bikes & Brews festival, filled with talented bands, plenty of food, and of course a ton of local brews! Head on over to the West Shore Grill for a beachside dinner and rum runners before the sun goes down. After an epic dinner in South Tahoe, head on over to the Outdoor Arena at Harvey's for a summertime jam. On my visit, Jack Johnson was in town playing two nights. As the sun started to go down, the sky turned bright orange with cotton-candy-colored clouds. The venue was walking distance to the main area of town. Wake up early and have breakfast at Heaven’s Little Cafe at the base of Heavenly Mountain. This place serves up hearty breakfast burritos to fuel an adventure-packed day, as well as a number of other breakfast treats. Hop on the Gondola and head up to the first stop, which is the observation deck. The stunning panoramic views of the sapphire lake below will be hard to walk away from, but you won’t want to spend too much time taking in the views, because epic adventures are waiting! Epic Discovery is an adventure area atop Heavenly, full of thrilling ropes courses and zip lines courses! This is the best place for thrill seekers and adrenaline junkies to get their fix while zipping through the tree-tops of Heavenly Mountain. Walking into a ski lodge in the summer feels a little strange at first, but Tamarack Lodge is sure to please. The lodge has so many options, including a killer salad bar. Outside is an area for bands to play and entertain guests while they re-fuel for more ropes courses and zip-lines! For the ultimate adrenaline rush, reserve a ride on the Blue Streak zip-line at Heavenly. With top speeds of up to 50mph and 3,300 feet to zip across, this ride definitely gets the blood pumping while giving you a birds-eye-view of Lake Tahoe as you zip by. Riva Grill was my favorite restaurant in Lake Tahoe. With views of the lake, beautifully plated meals and a stellar wine list, Riva is sure to please your taste buds. Be sure to snag an outside table and try their multiple versions of rum runners, apparently it’s Tahoe's signature drink, you have to try one! The Marriott Grand Residence in South Lake Tahoe never disappoints. Each room is like a small apartment with a refrigerator, oven, dishwasher and dinette area. Staff is always extremely friendly, and eager to help.